BMW Z3 M Coupes have always been, since their inception, a strange beast. First built in secret, almost entirely out of leftovers, the final years of the M Coupe had 3 generations of 3-series parts. The front suspension was from an E36, the rear from an E30, and in the last 2 years of production the motor was pulled from an E46. Given these strange origins, it is not a surprise that it is such a polarizing car. Many a coupe owner has proudly looked upon a stranger examining their car, only to be told that it is the ugliest thing they have ever seen. Mark Scire’s 2002 M Coupe is undeniably beautiful, even if you are not a big fan of the M Coupe. His car perfectly embodies his OEM Plus ideal of modifying cars, with just the right bits changed out or improved. He started his journey with the purchase of an S54 coupe, not an easy task as the S54 cars account for only 678 of the 2,858 M Coupes sold in North America. The Titanium Silver paint never fails to look spectacular as the sunlight helps it to accentuate the slippery contours of the E36/8. Unusual for a modern car, many M Coupes received a two tone interior, and Mark’s M Coupe is one such case, sporting a Dark Gray and Black Nappa interior. These gray panels on the seats, center stack, and dashboard set off the gray gauges unique to the S54 coupes. Rowing through the gears of the five speed gearbox is done with a ZHP style shift knob, its weight giving a satisfying mechanical feel to the action. Shifting occurs very often, thanks to the switch from the stock 3.15 ratio differential to a very short 3.73 unit. Mark has also made the cockpit a much nicer place to be with the replacement of the US-spec dashboard underpanels with their European equivalents. These eschew the crash bracing required by US standards, and offer a much sleeker look, not to mention much more room for your knees. This, combined with the Thayer Motorsports seat tilt kit, actually make the driver’s seat of this M Coupe a nice place to be on long drives. Not as nice on the long drives is the custom exhaust fabricated by Piper Motorsports, consisting of dual Magnaflow cans, but it is wonderful while whipping around town or down choice backroads. The stock-looking quad tips emit the classic S54 rasp, loved by some, hated by others, which suits this car perfectly. Further improving the performance of this M Coupe is a set of Ground Control coilovers paired with Vorschlag camber plates. This setup rides very well on the street or at an autocross, and also allows Mark to create a beautiful, yet functional stance. 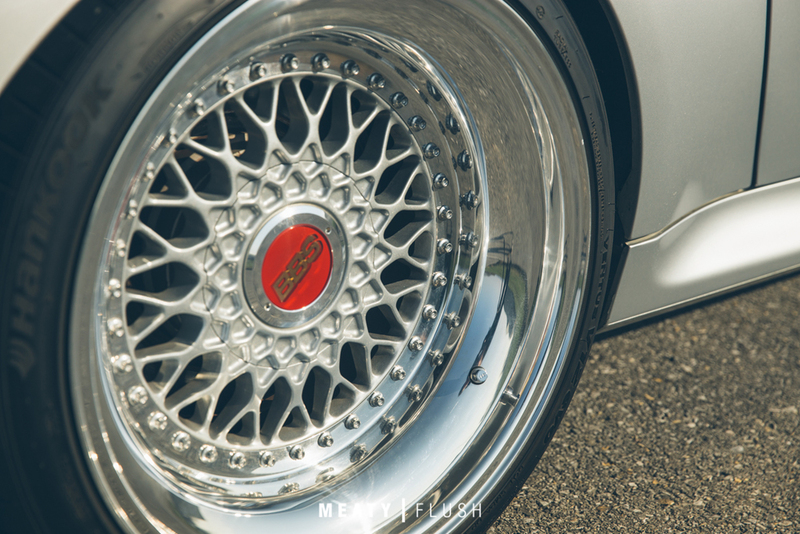 The wheels are BBS RS211 centers, stepped up to an 18 inch diameter courtesy of Rotiform bubble lips. The wheels are built to an 11 inch width in the rear and 9 inch width up front, offering plenty of grip with the Hankook summer tires Mark has selected. The only modification made to the body of this M Coupe is the addition of AC Schnitzer Front Flippers, mounted to the front bumper. These splitters accentuate the already aggressive looking front end of the M Coupe, and actually add a bit of downforce at high speeds.